MONROVIA – More than 100 international students from Jiangsu Province, China, visited Monrovia Unified as a part of the culture immersion program from Jiangsu Education Services for International Exchange (JESIE) program, attending Mayflower, Plymouth, and Bradoaks Elementary for four days of school activities. At Plymouth Elementary, a Mandarin Dual Immersion school, students quickly connected with international students as they shared the obstacles they face when learning a new language. In addition to day-to-day school activities, principals coordinated field trips to Canyon Park, Monrovia’s Public Library, and Monrovia’s Fire Department Headquarters to give students a taste of the community. International students who visited Plymouth performed a Chinese song and dance as a thank-you to faculty, staff, and students during the school’s monthly honors assembly on Jan. 25. Each student was then honored with a certificate, presented to them by Dr. Gero and Renaissance students. 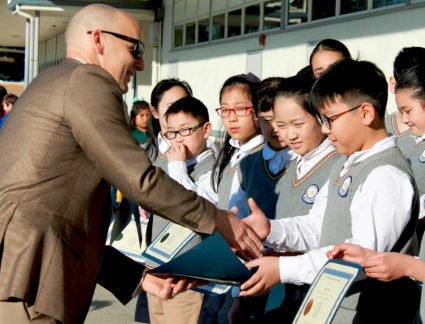 Monrovia Unified School District began its partnership with JESIE a couple of years ago when the district cosponsored the 13th Jiangsu International Forum for School Principals in Los Angeles in 2017, and was then invited to Jiangsu Province to participate in the 14th Jiangsu International Forum. At this time, Monrovia Unified established sister schools with Gulou District, which is one of the top school districts in Jiangsu, China. Sister schools present an opportunity for international students to experience school in the U.S. for four days. At Monrovia Unified, dual immersion programs create a connection to academic success, while challenging students to not only learn about new cultures, but appreciate them, as well. 1-25-19_MUSD_International2: Plymouth Elementary Principal Dr. Gero honors international students during the school’s monthly honors assembly with certificates for completing a full week of instruction at Monrovia Unified School District. Plymouth Elementary Principal Dr. Gero honors international students during the school’s monthly honors assembly with certificates for completing a full week of instruction at Monrovia Unified School District.